As I'm sure most of you know, I love makeup! I'm no makeup artist and I'm probably not even above average when it comes to skill, but I'm obsessed with trying new products, techniques and routines! 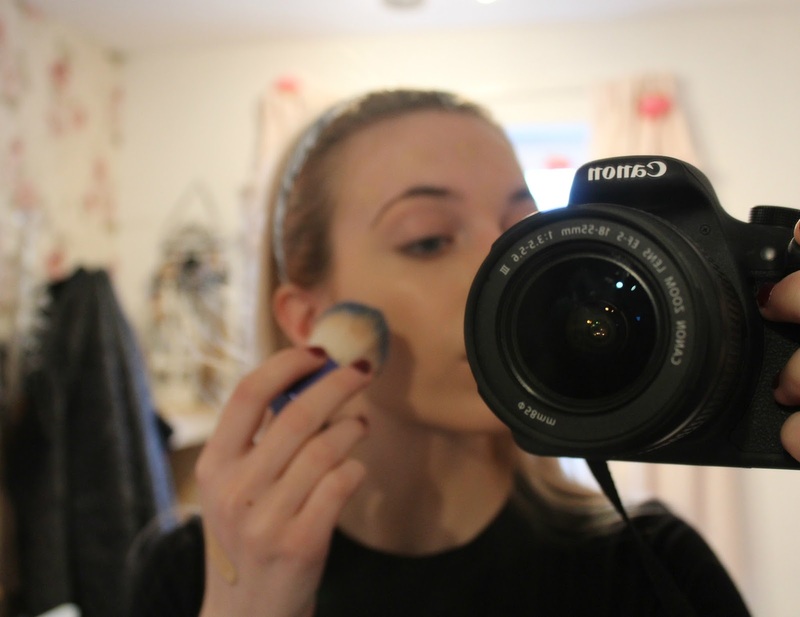 It dawned on me the other morning that I haven't done a blog post in a while (sorry about that - I've been super busy), but I have also never done an actual makeup routine or makeup "look" post! Straight away, I knew I had to give it a go! What you see above are mainly the products that I will use on a daily basis, along with some extras like the Lancôme and Chanel Lipsticks that I often only apply on the weekends. The first thing I will do before applying any makeup is moisturise. This is the absolute key to have a long lasting base for your makeup. I strongly recommend Nivea's Daily Essentials Express Hydration Primer which is a combination of both moisturiser (that works wonders for dry skin) and primer. 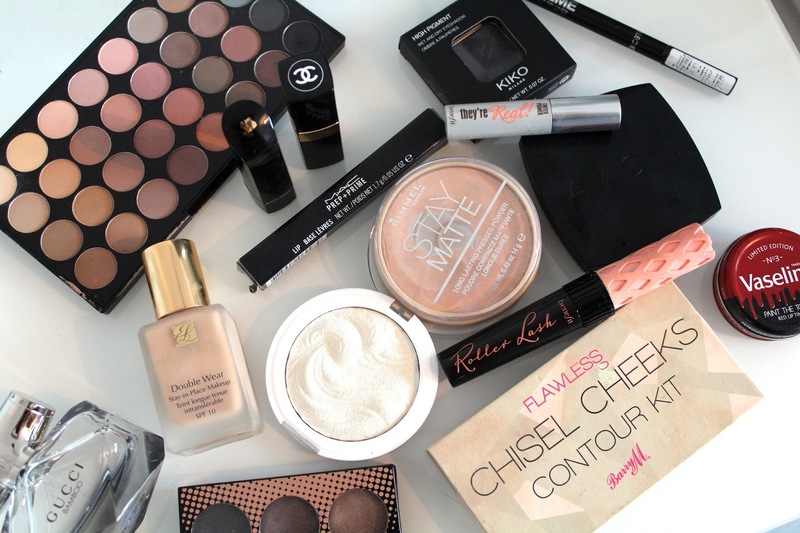 I never apply my makeup without it! After applying the primer/moisturiser, I go straight in and cover up any discolouration or blemishes with my Collection Lasting Perfection Concealer in the shade cool medium. This shade is actually very dark and slightly orangey when first applied, but upon blending it into my skin the product seems to combine and harmonise well with my skin tone. As I don't have very problematic skin, this is a very quick and easy step to cover up tiny problems. 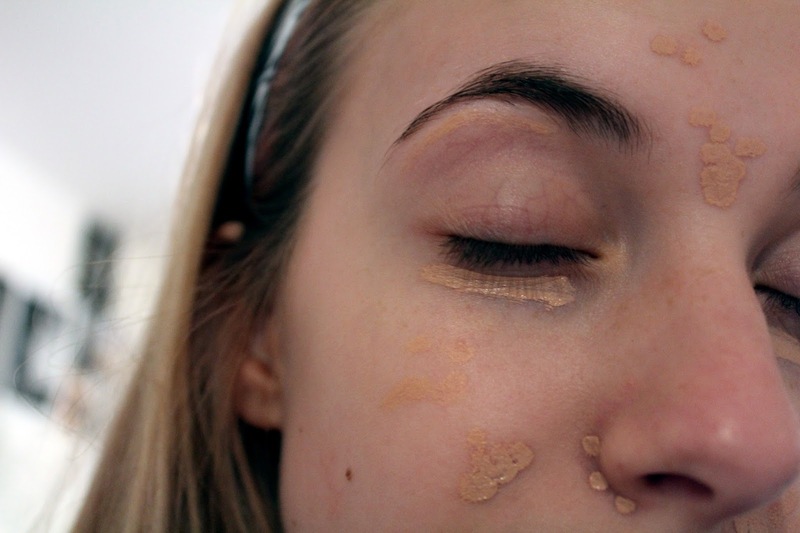 However, if you do suffer from anything like acne or acne scaring, I recommend that you use the concealer after (or even before and after if your blemishes are very prominent) applying foundation, but for this you will have to make sure that the shade is pretty much exact to your skin tone. Directly upon applying and blending the concealer, I apply my Estee Lauder Double Wear Foundation in the shade Ecru. To blend this I use my Topshop Kabuki brush and make sure the product is worked into all parts of the face and neck. I will then use my Real Techniques Powder Brush and tap on a very light base of Rimmel's Stay Matte Powder in shade 004 Sandstorm to set the base. I really recommend tying your hair back or using a hairband with plastic bristles underneath to scrape the hair and keep it securely out of your face. I then move on to contouring. For this look I have just used some powder contour colours rather than liquid as it doesn't make this somewhat natural look come across as 'too heavy'. For this I used all three brushes from my Real Techniques Collectors Edition Sculpting Set. 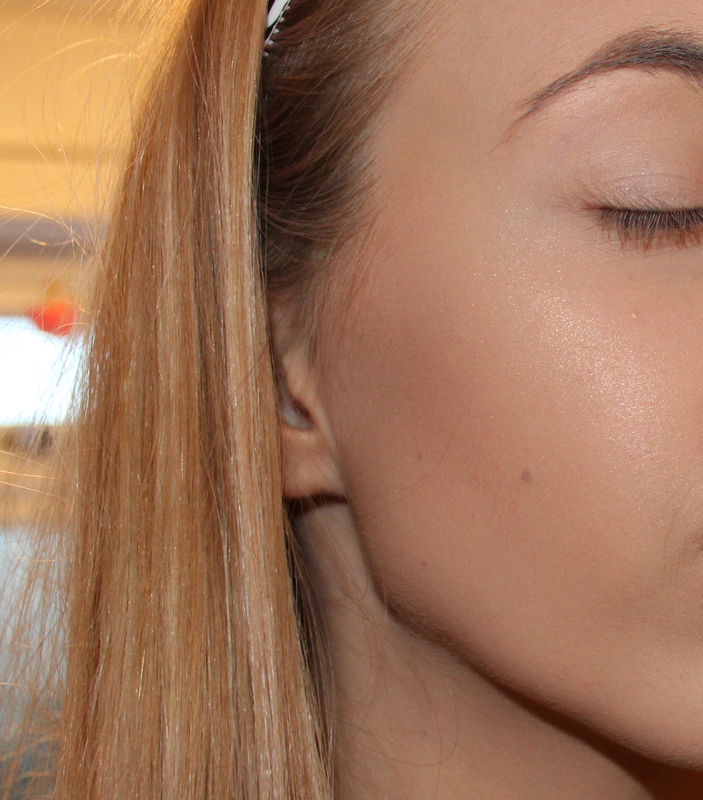 I took the dark brown from my Barry M Chisel Cheeks Countour Kit and used it with a Real Techniques Bronzing brush to define my cheek bones. I then followed this by using the Real Techniques Highlighter brushes to apply and blend my MUA Iridescent Gold Highlighter. This creates a defined yet dewy skin look. Following this step I apply an extremely faint Avon blush in the shade soft plum to give my cheeks a very slight 'rosy' look. 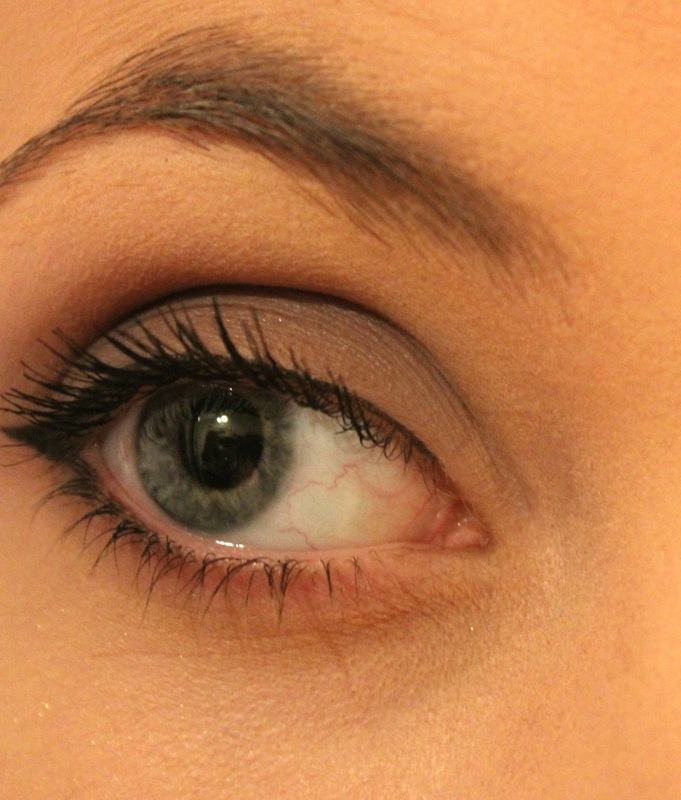 I then move on to eye makeup which does tend to take me significantly longer than any other part of the makeup process. Immediately after finishing my face/base makeup I will apply my MUA Eye Primer or my E.L.F Eye Primer (depending on which one is closer to me at the time - they both work exactly the same) to set a base for the eyeshadow. Throughout the process of base makeup I always make sure that I have put a small amount of primer, foundation and powder on my eyelids as well which also helps the eyeshadow to set and aids the effect of the primer in lasting longer. Once the primer is on I use my Autograph Eyeshadow brush to apply the shade 'Tempt' (a rosey purple) from the MUA Romantic Efflorescence Palette starting from the outer corner of my eye and into the centre. I follow this with the shade 'Stonewash' (subtle light purple) from my Front Cover Hot and Cold Palette with a Topshop Blending Brush and apply this again to the outer corner of my eye and blend it up into the crease. I then repeat these two steps with a Kiko Milano High Pigment Eyeshadow in 09 (matte brown) with a different Autograph Eyeshadow Brush to add a base and outer eye colour. Then, using my Real Techniques Blending Brush I use another Kiko Eyeshadow in number 15 (matte black) in the outer corner and edge of the upper crease and lower waterline to give the look a very slight smokey eye effect. Finally, I go back to my original Autograph brush and pat on the shade 'Flaw' (cream toned white) from the Makeup Revolution Flawless Matte Palette in the inner corner and blended out to the centre to give the eye a gradient effect. Over this, I then apply my Collection Extreme 24 Hour Felt Tip Liner to add some winged eyeliner to my look. After this I curl my lashes and place one smooth coat of Benefit's Lash Primer on my upper and lower lashes followed by two coats of Benefit's Roller Lash Mascara on only the upper lashes. This gives an extremely simple yet noticeable eye look, perfect for a weekend out with friends, family, etc. I apologise for this not being the best picture in the world, but as you can see, the colours blend quite naturally and nicely with the added liner and mascara really finishing off the look well. Disclaimer: I'm no brow queen. I really dislike the shape, colour and length of my brows. No matter how much I pluck, wax and tint, they always come out looking pretty much exactly the same! Because of this I try not to spend too much time dwelling on them. 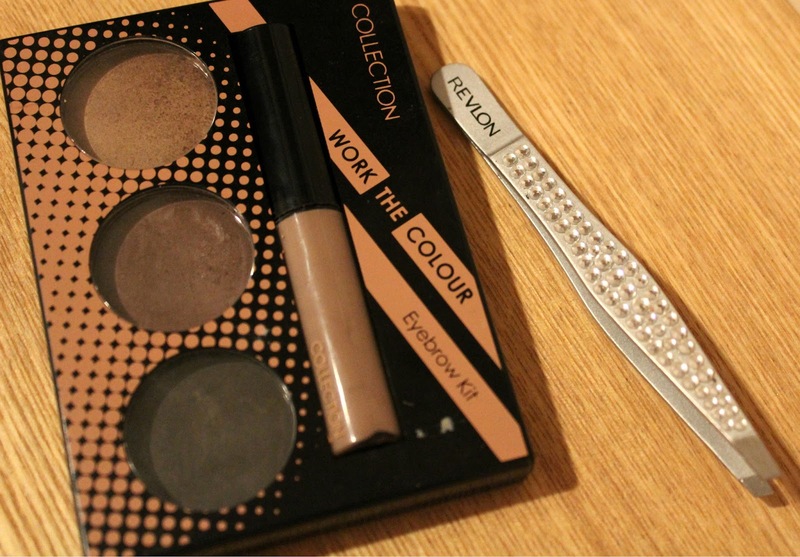 I use my Topshop Eyebrow Brush in the shade medium brown from the Collection Work The Colour Eyebrow Kit to emphasise my natural shape and fill them in. Occasionally I will pluck them into a better shape with my Revlon Tweezers which helps to clean up the edges. I will also sometimes use my Autograph Natural Shimmer Liquid Highlighter to define the shape, but this is only when I'm having one of my rare 'good eyebrow' days! As you can see, they're really nothing special. I mainly use product on them just to fill them in as they are naturally very gappy! Lastly, the final step is lipstick! If I'm putting on makeup, some sort of lip colour is essential, I can never leave them plain. I usually apply Paint the Town Red Vaseline just after I finish my face makeup and before I start the eyes. This moisturises my lips and allows them to dry before I actually get to the point of applying the lip colour. Between finishing my eye makeup and starting my brows I will always apply Mac's Prep and Prime Lip Primer. Truth be told, I absolutely hate the packaging and form of this, but the product itself works wonders. On a day to day basis (when I'm going to sixth form or into work) I will put on Mac's Mehr Matte Lipstick. This is quite a natural pink shade which isn't very 'in your face' but still adds a very neutral pop of colour to your look. Recently, I've purchased excessive amounts of matte drying liquid lipsticks which I'm absolutely in love with! For this look I decided to go with the NYX Matte Soft Lip Cream in Transylvania. 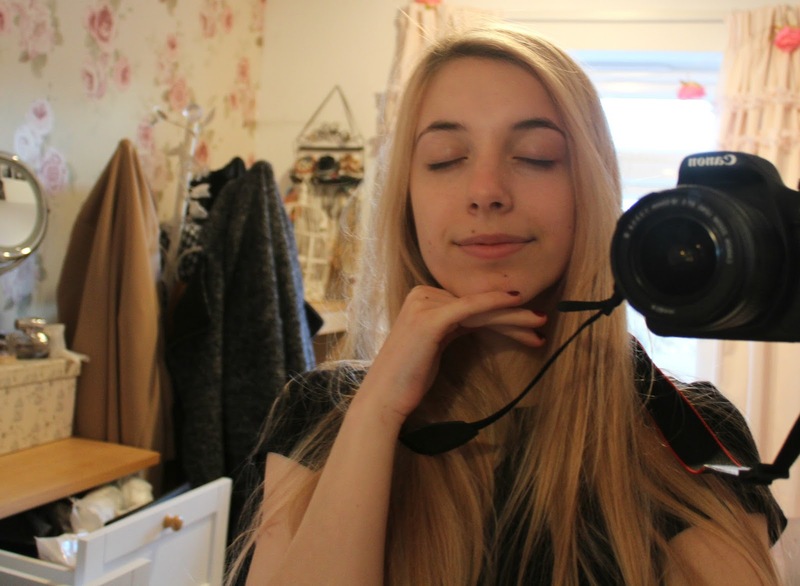 This isn't a very good picture as I'm pretty awful at selfies (what am I even looking at?!) but you can clearly see how effective the makeup, specifically the base makeup, is! I really loved doing this post and I hope it may have been somewhat helpful for any of you reading or looking to try new products! I only ever wear products that I'm 100% happy with so all of the products I've mentioned here are definitely worth checking out! Let me know if you want to see more posts like this, if this was helpful for you, or if you have ever tried any of the products I'm wearing! I also love to hear your recommendations so if there's any products you love using as an alternative to the ones I apply, let me know! Roller Lash is my go-to!! 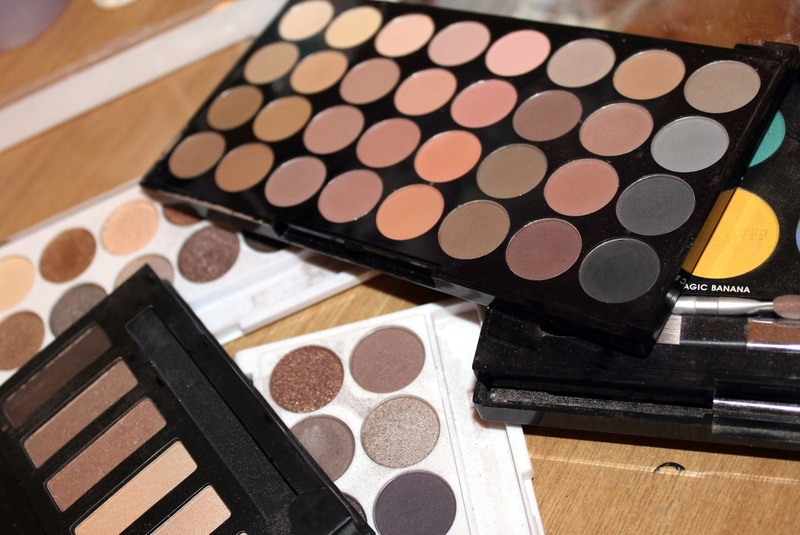 You look lovely and your makeup is perf! I love how pretty, natural and classic your eye makeup is! beautiful look! I really like your makeup! This is such a pretty look! Your brows look amazing hun! This look is so pretty and I love double wear it's my all time favourite foundation! Looks fab! My weekend makeup routine is BB cream and Mascara.... I'm really lazy hahaha! You look absolutely gorgeous! I love the Collection Lasting Perfection Concealer it's such good value for money. Love your makeup routine! The eyeshadow makes your eyes pop and you have mastered a gorgeous cat eye! I love how you contour your face, radiant! Also I do agree that powder bronzer works well than the cream one! 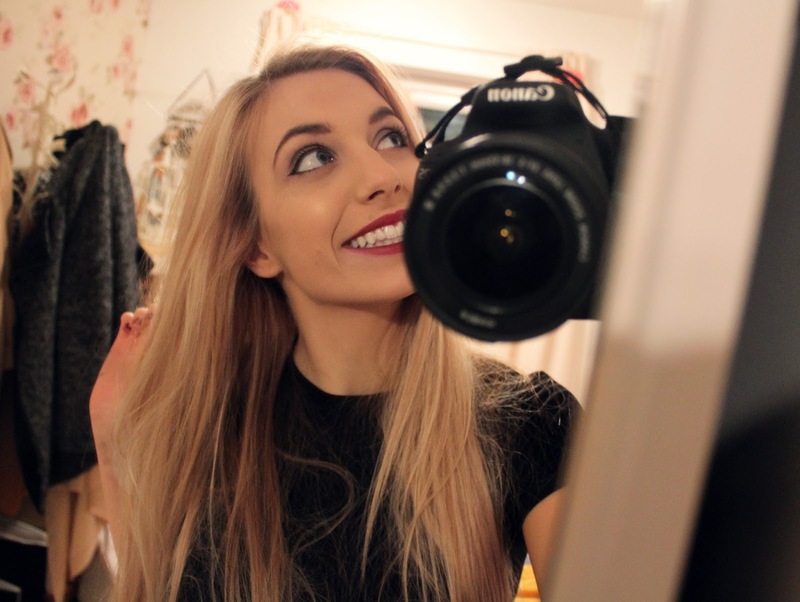 Love your blog :) Btw, I've followed you via Bloglovin, mind to support each other by following back? Thanks a lot!